LOUISVILLE, Ky.--(BUSINESS WIRE)--Papa John’s International (NASDAQ: PZZA) continues to strengthen its commitment to BETTER INGREDIENTS. BETTER PIZZA.—and its broad range of menu offerings—by taking its Gluten-Free Crust made from Ancient Grains nationwide. The new, never-frozen Gluten-Free Crust is made with sorghum, teff, amaranth and quinoa. A two-topping pizza made with Papa John’s new Gluten-Free crust is available now for only $9.99. The Ancient Grains are naturally gluten-free and higher in protein and fiber than other grains, while adding a more robust texture and flavor to the crust. The national offering is a direct result of recent pilot testing earlier this year in Los Angeles, Phoenix, St. Louis, Houston and Nashville. For consumers, the availability of a gluten-free crust option was a leading factor in deciding where to order their pizza from and has driven an increase in new customers. According to Mintel, gluten-free food sales grew 178% from 2013-16 and the percentage of consumers eating gluten-free versions of foods that typically contain gluten continues to trend upward. Operationally, Papa John’s employs procedures to prevent contact with gluten, and while the crust is prepared in a separate, gluten-free facility before being shipped to stores, it is possible that a pizza with gluten-free crust could be exposed to gluten during the in-store, pizza-making process. Therefore, the brand does not recommend its Gluten-Free Crust made with Ancient Grains for customers with Celiac Disease or serious gluten intolerances. In 2016, the brand announced the elimination of artificial flavors and synthetic colors across its entire food menu. Last summer, the pizza brand also fully transitioned the chicken used in grilled chicken pizza toppings and poppers to be fed on a vegetarian diet and raised without human or animal antibiotics, and went completely cage-free with its eggs. 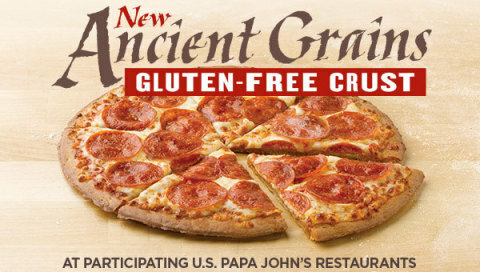 For more information regarding Papa John’s new Gluten-Free Crust made with Ancient Grains, please visit the frequently asked questions page on the Papa John’s website. Headquartered in Louisville, Kentucky, Papa John's International, Inc. (NASDAQ: PZZA) is the world's third-largest pizza delivery company. For 16 of the past 18 years, consumers have rated Papa John's No. 1 in customer satisfaction among all national pizza chains in the American Customer Satisfaction Index (ACSI). Papa John's is the Official Pizza Sponsor of the National Football League, the Official Pizza of Major League Baseball and the Official Pizza Partner of the National Hot Rod Association (NHRA). For more information about the company or to order pizza online, visit Papa John's at www.papajohns.com. Also visit us on Facebook at www.facebook.com/PapaJohns, Twitter at http://twitter.com/PapaJohns, YouTube at www.youtube.com/user/papajohns, Instagram at www.instagram.com/papajohns, and Pinterest at www.pinterest.com/papajohnspizza. Looking to be a part of something Better? Join the Papa John's Pizza Family at www.papajohns.com/careers/ and www.papajohns.com/franchise.